You can email Morgan Bulleigh Upholstery at hfunke.mb@hotmail.com to with any additional questions! Morgan-Bulleigh is a full service interior shop specializing in repair, restoration and custom work on all makes and models of cars, trucks, boats, small planes and furniture. Our employees have over 125 years experience in the industry. Whether you need a custom interior, a full restoration or just a minor repair we can do a quality job at a competitive price. 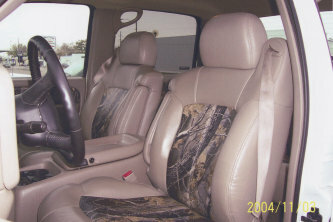 We are a Katzkin dealer and can install a factory or custom leather interior in your car or truck. If you own a boat, old or new, our experience in replacing vinyl, carpet, flooring or seating framework can get back on the water or ready for the upcoming season. No one in this area builds a better travel or mooring cover or bimini top at a competitive price than Morgan-Bulleigh. If you have damage, burns, small nicks or cuts in vinyl, plastic, leather, carpet or headliners, we can make them disappear. We can even come to your home to repair or dye leather and vinyl furniture.